🤗 It's not difficult to understand this happy smiling face with kind eyes and open hand gesture in the front of it - it offers you a hug. It is hard to understand otherwise. It can be a friendly embrace, or just support in a difficult moment. Someone uses it instead of saying "hello", someone to say goodbye. 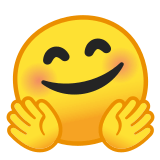 Hugging Face Emoji was approved as part of Unicode 8.0 standard in 2015 with a U+1F917 codepoint, and currently is listed in 😀 Smileys & Emotion category. 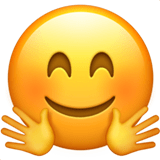 Use symbol 🤗 to copy and paste Hugging Face Emoji or &#129303; code for HTML. This emoji is mature enough and should work on all devices. You can get similar and related emoji at the bottom of this page.